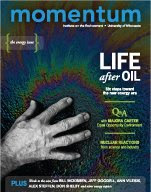 Momentum is the quarterly magazine of the University of Minnesota's Institute on the Environment. The Institute is the University's research hub tackling all issues environmental, including climate change and renewable energy. They're doing some really fantastic work - go check them out. Experts from the nonprofit sector, business and the blogosphere were asked to give President Obama advice on energy policy. Read my letter on page five of Momentum.